Boris Malagurski's new film finally on DVD! This is the story of Belgrade, the dazzling capital of Serbia. People from all over the world are attracted to this city for its charm and beauty. From the quiet cafes, to the sparkling nightlife, Belgrade is a city that never sleeps. It has magnificent architecture, peaceful parks, splendid restaurants with authentic Balkan food, remarkable art and electrifying museums. A city between East and West, with a turbulent history to tell. But what makes Belgrade the most appealing is the spirit of its people. Belgrade has the most interesting men and the most enigmatic women. Some of the best sportsmen in the world are from Belgrade. Anyone who experiences this city will undoubtedly fall in love with it. Welcome to Belgrade. 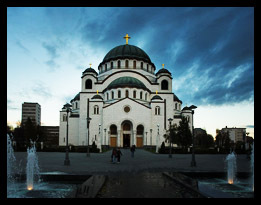 This is a documentary film about the spirit of Belgrade, its people and the historical circumstances that shaped Serbia�s capital throughout its existence. As a land from which positive news rarely appears in Western media, Serbia has a valuable jem which is yearning to be discovered, waiting for world recognition for its charm and beauty. The film is narrated by Malagurski, in English, and aimed at Western audiences, most of which have grown tired of the typical European destinations such as London and Paris, or even Prague and Budapest, and are looking for something fresh new. Belgrade�s energy, vitality, spontenaity and the heart and spirit of its people is what fueled the film team and we hope that you will enjoy this film. Boris Malagurski is a Serbian-Canadian film director, producer and script writer based in Vancouver. His previous films have won prestigious awards and were broadcasted in over 80 countries world wide (including on RT). Highlights include the Silver Palm at the Mexico International Film Festival and Best Film at the BC Days Documentary Film Festival for �Kosovo: Can You Imagine?�. His film �The Weight of Chains� has received critical acclaim from Palme D�Or winner Emir Kusturica and was shown at London's Raindance film festival, Beldocs and festivals in Havana, Ann Arbor, Toronto and cinemas across the US, Canada and Australia. This is a list of sponsors and contributors of the film, if you'd like to donate towards helping us promote the film throughout the world, please click "Donate Now", or you could contribute by contacting us. All donations will be listed on this website. Copyright by Malagurski Cinema. All rights reserved.